Leonard Brereton was a keen photographer and his descendants (who were kind enough to provide his personal diary for the site) also have some of his photographs. There are some terrific photo's below and I hope you enjoy them as much as I have as each has it's own story! I have looked into the individuals noted below as "free" time whilst at the Archives has allowed and will explore the others in more detail as time allows. Please feel free to contact me if you can add or correct any information. Anne Chappel and her family own these photographs and the below are significantly reduced copies of them. As with his diary, please seek their approval before attempting to reproduce them or use them for anything other than personal use. Captain William Stuart CHIRNSIDE, MC & Bar. He had already won a Military Cross when this photo was taken and was recovering from wounds picked up on Gallipoli with the 1st/5th battalion. He went onto win a second M.C. for his bravery at Oppy Wood at the end of June 1917 whilst commanding C Company of the 1st Battalion. He went on to temporarily command the 1st battalion in 1918 and survived the war. Looking at his almost cherubic smile and comparatively small stature, one could be forgiven for not realising just what a superb combat leader he truly was! William is on more of the photo's below. Lieutenant Lewis John Francis OERTLING was the son of Henry and Emily Oertling from Barnes in Surrey and served very briefly in the 5th battalion until transferred to become a pilot in the newly formed Royal Air Force. Sadly he died in 5th Squadron of the RAF on the 8th August 1918 and is buried n the Vignacourt Cemetery. 2/Lt Alexander George HUCKLESBY arrived in the 1st/5th battalion of the Bedfordshire regiment in Egypt on the 1st December 1916 and served there until transferred to the Army Pay Corps where he served the rest of the war out and got through unscathed. 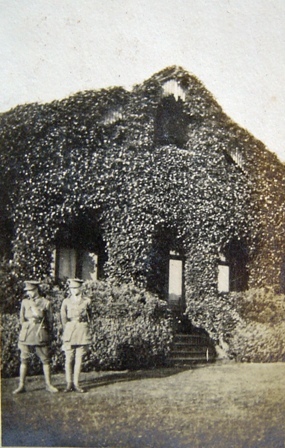 Below are "G.R.Buck and Powell" standing outside Aston lodge in the Summer of 1916. Lieutenant George Reginald or Charles Frederick BUCK. This could be either brother as Charles arrived in the 1st/5th battalion in Egypt on the 1st December 1916 so trained at Halton at the right time. 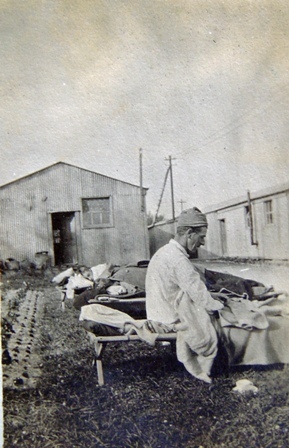 He served in the battalion until August 1917, when he was transferred back to England so his movements appear to match. However, the notes on the photo refer to this being G.R. Buck, which was his brother George Reginald BUCK who served in the 4th battalion in 1917 but who's whereabouts I cannot vouch for at the time of the photograph. 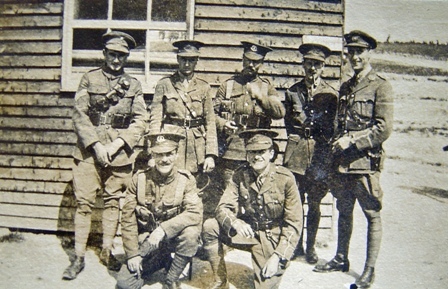 2/Lt Powell could be one of three Officers - Lieutenant Frank POWELL, Captain Arthur Nugent Waldemar POWELL or Herbert William John POWELL but I am unable to suggest which of thses is the most likely option. 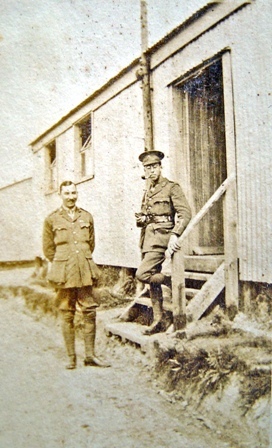 This is Captain CHIRSNSIDE (without a hat) and 2nd Lieutenant George Harold PINCHIN (standing on the Office steps). 2/Lt Pinchin served in Egypt from the 14th August 1917 but died from wounds received during the 3rd battle at Gaza, as can be seen in his biography (follow the link from hsi name for details). "Letchford" who was 2/Lt Charles Percival LETCHFORD. "W.S. 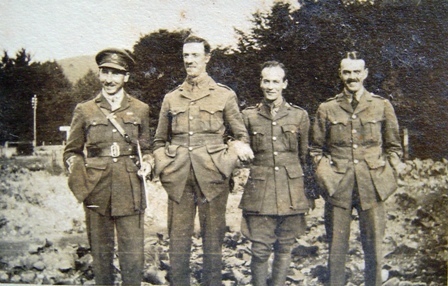 Davis" was Lieutenant William Stanley DAVIS, whom Leonard Brereton seems to have had a special friendship with, including playing tennis with his Davis' sister Evadne and Leonard's sister Eunice whilst at Bedford. He went to France to serve in the 4th Battalion and was killed on the 22nd March 1918, aged 22, during the German Spring Offensives on the southern fringes of the Somme. His biography can be seen by following the link above. "Strugnell" who was Lieutenant Milton Arthur STRUGNELL, who joined the 1st/5th battalion in Egypt in December 1916. "Hucklesby" is 2/Lt Alexander George HUCKLESBY, mentioned above. "C.F. Buck" is 2/Lt Charles Frederick BUCK who arrived in Egypt with the 1st/5th battalion 1st December 1916 along with many others on this page and is mentioned above. One can only assume the young officers were being trained in sleeping outdoors or some similar activity! 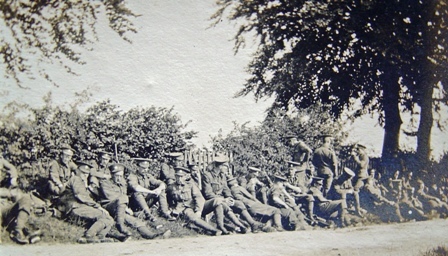 According to the caption on the back of the photograph, from the farthest away they are 2/Lt's POWELL (mentioned above), H.W.E. SMITH and Arthur John MANDER (also mentioned above). Here is the very young looking Second Lieutenant POWELL, although I cannot say which one for certain, as discussed above. 2/Lt Harris, who must be 2/Lt A.S. HARRIS who went to one of the battalions in France. 2/Lt Reid (possibly George Frederick REID, MC). 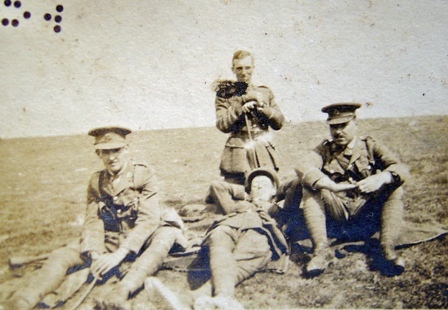 2/Lt Leonard BRERETON, the owner of this album. 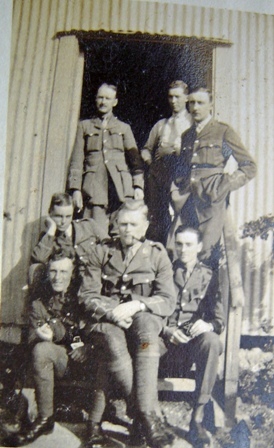 None of the men appear to be 1st/5th battalion men and all of them apart from Leonard seem to have survived. Lt. William DAVIS and 2/Lt. 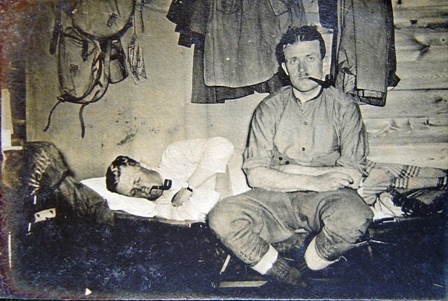 Leonard Brereton after what looks like a hard day's training. 2/Lt. Powell again, as in other photos. 2/Lt. C.F. Buck (Charles Frederick BUCK) who is also in other photos. Lt. Pinchin (George Harold PINCHIN), also shown above. 2/Lt. Strugnell (Milton Arthur STRUGNELL) who can be seen on several other photos too. 2/Lt. Letchford, as shown above. 2/Lt. Hastings. Possibly this is E.W. HASTINGS who was taken prisoner in the 4th battalion in August 1918 but I am unable to confirm this so far. 2/Lt. Wilson, who could be one of three 2/Lt Wilson's; W.O., R.C., or T.P. 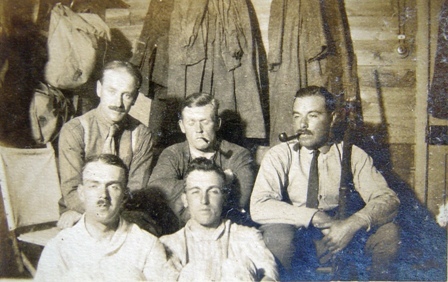 The latter, Thomas Percy WILSON, was killed as the 7th battalion stormed the impregnable Schwaben Redoubt in September, one month after the photo was taken but arrived with them in July, suggesting this is not him. 2/Lt. 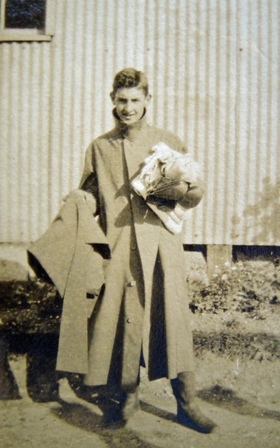 Davis (William DAVIS), Leonard Brereton's closest friend in the camp. 2/Lt. Waterton, (John Edward Mary Claude Pius Augustine WATERTON) whowas killed n the 1st/5th battalion in November 1917. 2/Lt. C.F. Buck, (Charles Frederick BUCK) who has been on several photos already. 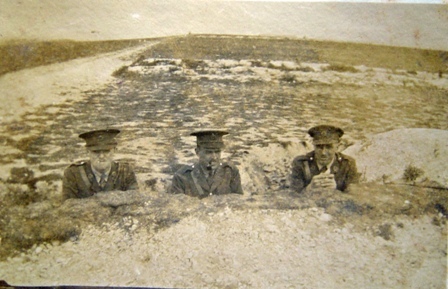 The three Officers posing as Meerkats on Buckland Range in 1916 and trying to look very serious and officer-like are "Moxon, Hucklesby and Cookson". Hucklesby is mentioned at the top of the page and Cookson MAY be the later Major C.E. COOKSON who went on to served in the Gold Coast Regiment. Considering Leonard Brereton came from the African Campaigns, this may be possible but is nonetheless unconfirmed. Hugh Moxon's biography is shown here. 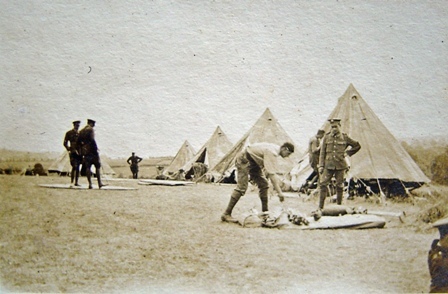 The photo below was taken on field exercises in 1916. You can almost hear the Sergeants shouting "fall out" moments earlier ... A lovely, impromtu snap of relaxed soldiers, just as they should be. 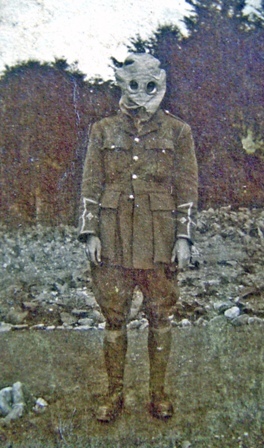 Leonard Brereton himself sporting riding breeches and a Gas Mask. 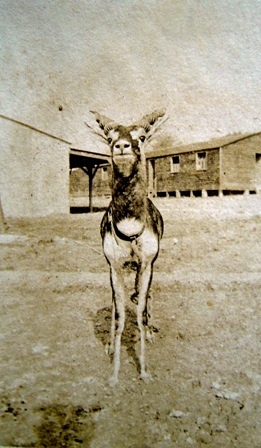 3rd/5th Battalion's mascot - a lovely photo.